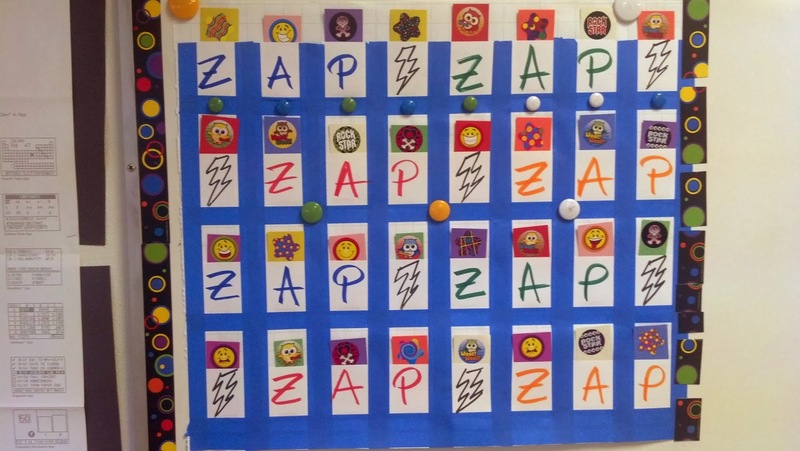 We played ZAP today for our review game. I wrote about the game here. First I created this board and hung it up 2 days ago. Students were curious about it, and wanted to know how we would use it. I love to pique their interest. To create the board, I needed 20 - 30 pockets. I made mine with tape and index cards. Then I had some old construction paper already cut into 2 x 4 inch strips that I used for my cards. I wrote varying points on the cards ... 4 cards had 500 points, 4 cards had 300 points, 3 cards had 100 points ... etc ... down to 20 points on some cards. Then I wrote silly actions on others ... do the chicken dance and earn 500 points; dance like ballerinas and earn 100 points; give your points to another team; trade your points with another team. Last I created 4 ZAP cards - teams lose all their points when they pull a ZAP card. Then I put 20 problems in powerpoint that mirror the expectations on the upcoming test. Teams had fun with the randomness of the points today. We laughed as we worked and played. It was a good review day! Please DO blog about it! It's not original with me ... we must all share! My kids loved the surprise of the points. will be playing it tomorrow...can't wait. Thanks for the great idea!